So you’ve built a database for this year’s Christmas Card list, printed the cards with custom xkcd cartoons based on each recipient’s profession and mail-merged the lot. That’s a boring job automated and taken care of, with hopefully some fun technical challenges along the way. Except you have now had a backpack full of Christmas cards for over a week and it’s getting perilously close to the last posting date. Worse still, you’re attending a meetup in an unfamiliar place and have no idea where the nearest postbox is. Of course, you could ask someone, but where’s the fun in that? Plus, you anticipate that a least a few of your technical friends will have found themselves in the same predicament. Why not help them out, in the spirit of Christmas? 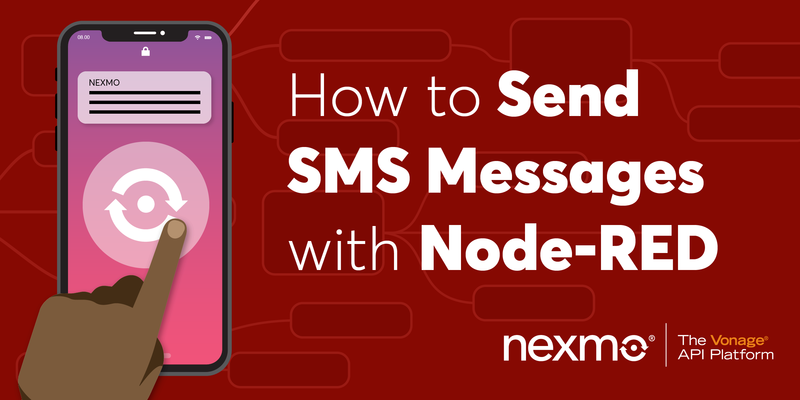 In this post, you’ll build and configure a Node.js/Express application that uses the Nexmo Messages API to let users send their current location via Facebook Messenger and get back a map with the location of their nearest postbox. Matthew Somerville’s “Find your nearest postbox service”. Details of every postbox in the UK was made available a few years ago in response to a Freedom of Information Request. Matt did the potentially expensive job of calculating the map coordinates of each postbox and making them available online. Facebook Messenger. Users who have the mobile app will be able to share their location details with us. Those who are using the web client or don’t want to share their actual location will be able to send their address instead. The LocationIQ API to convert addresses to map coordinates in a process known as geocoding. A Nexmo account to use the Messages API. If you don’t have one already, sign up and get some free credit. A Facebook account, ideally with a business page already configured. If you don’t have one already, we’ll talk you through creating one. A LocationIQ account to geocode addresses. You can use their free tier for this. express: the web application framework. body-parser: for parsing POST requests. dotenv: for configuring the application using an external .env file. nexmo ^2.4.2-beta-1: a beta version of the Node.js REST client library. You need this to work with the Messages API, which is also still in beta. request: to make calls to the postbox locator and LocationIQ geoocoding APIs. Have a look around. We’ll highlight some of the more interesting bits later in this post. However, there’s a bit of setup you must do before you can get it working. Sorry about that. But hopefully it’s more fun than traipsing around the streets in the freezing cold looking for a post box? First, you need to create a Nexmo application. 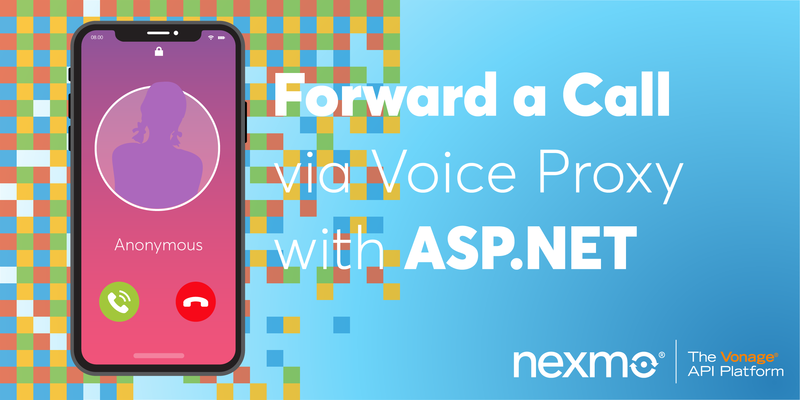 This is not an application in the same sense as the one you just downloaded, but instead a way for Nexmo to store authentication and other configuration information that you need to work with the Messages API. You can do this using the Nexmo developer dashboard or the Nexmo CLI. We’ll use the CLI in this post. Because the Messages API is still in beta, you’ll need to install a beta version of the Nexmo CLI to create a Messages API application. * The name of the application. We’ll use Postbox Finder. * The type of application you want to create. Here, it’s messages. 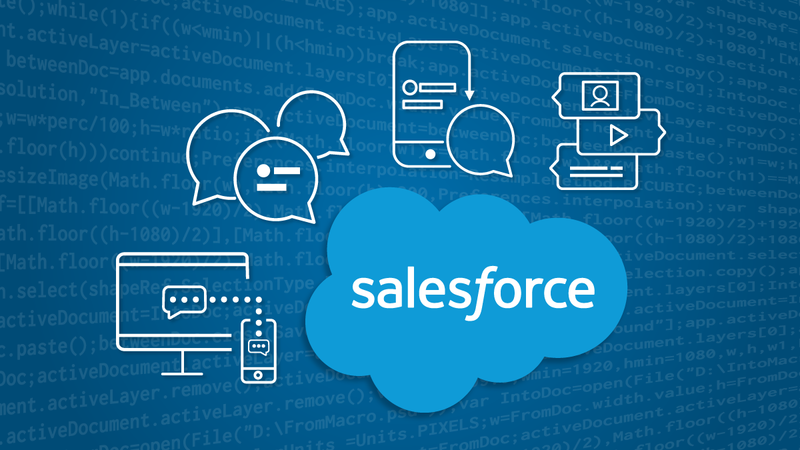 * The webhooks that the Nexmo Messages API will use to communicate with your application. These have to be publicly-available URLs. If you don’t have a public web server, consider using ngrok, as shown in this blog post. One to notify us about incoming messages from Facebook Messenger. We’ll use /webhooks/inbound-messages. Another to provide updates on the status of outgoing messages. We’ll use /webhooks/message-status. The name of the file within your application directory where the Nexmo CLI will store your authentication details. In this example, it’s private.key. Make a note of the application ID that the above command creates. It will be a GUID, such as 79f9c2dc-a9a8-4aa5-a3c4-c6910ef7b090. 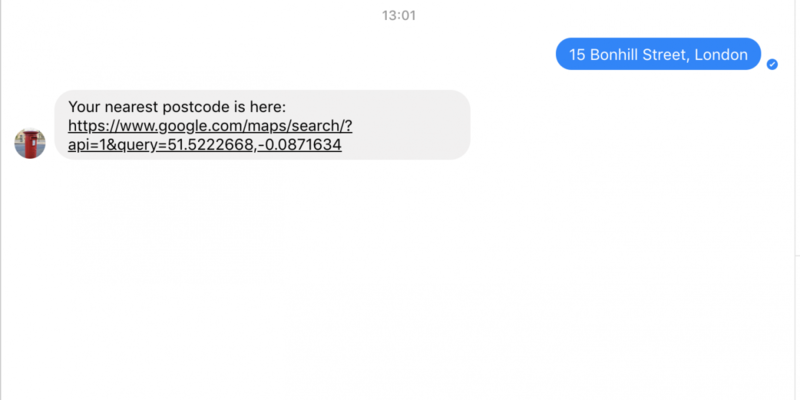 If you want to use the Messages API to send and receive Facebook messages, you must do so from a Facebook business page. If you already have such a page, then just make a note of the Page ID which appears in the page URL, e.g. 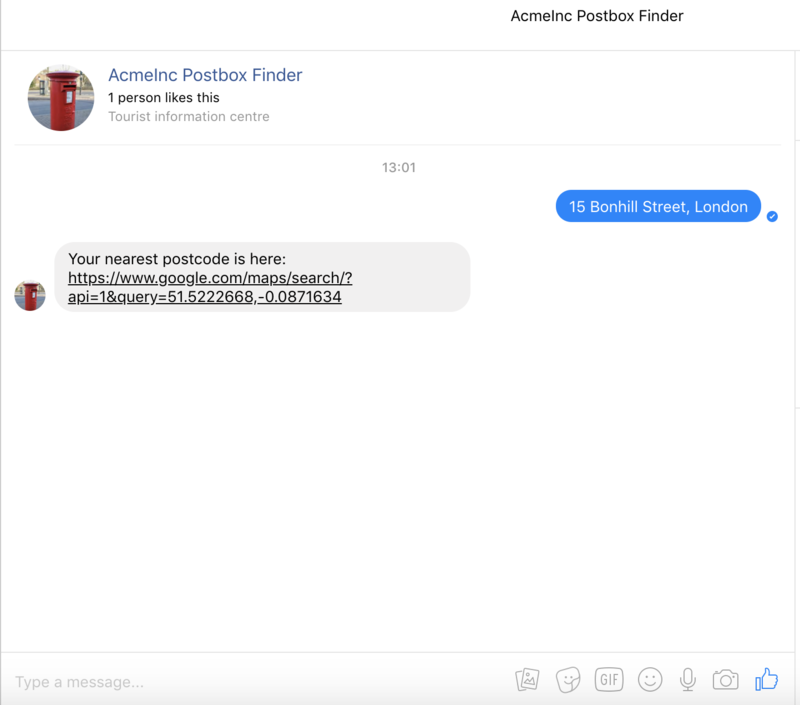 for the following fictitious page: https://www.facebook.com/AcmeInc-Postboxes-373699269870723/, the page ID is 373699269870723. If you don’t have a page for your business then you can create one. Make a note of your Page ID before continuing. If you don’t have a JWT, use the following Nexmo CLI command to create one, replacing YOUR_NEXMO_APPLICATION_ID with the application ID you generated earlier. 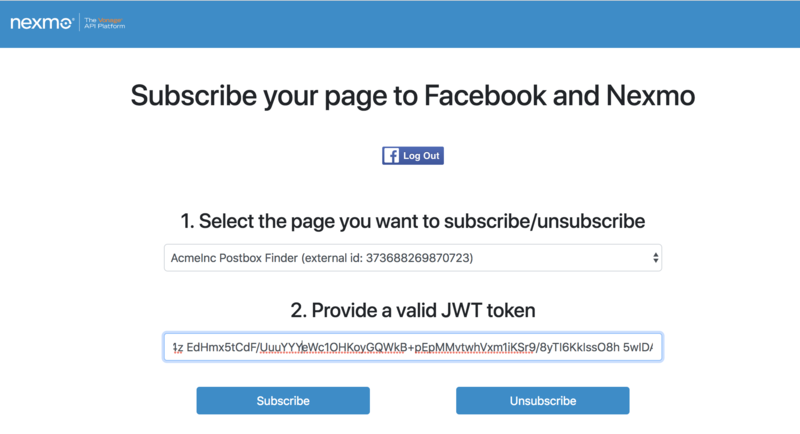 Execute echo $JWT to view the generated JWT, then copy it to the clipboard. 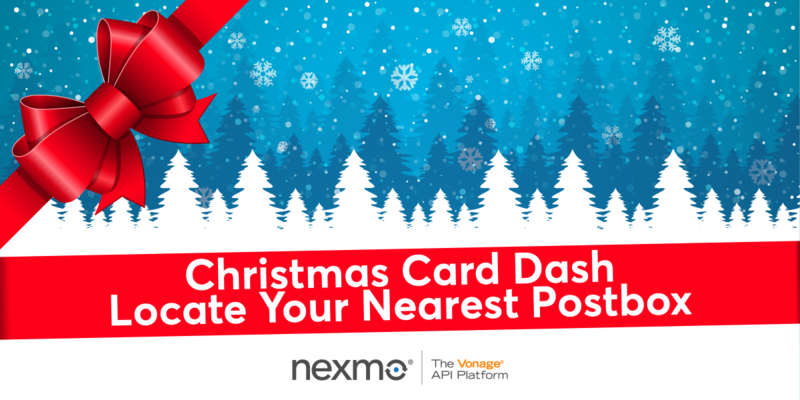 Your Facebook page and Nexmo account are now linked and you are almost ready to geek the heck out of this posting Christmas cards thing! However, you need to configure the Node.js application with all this information first. That’s all the hard work done. Let’s run this thing. If you are exposing your application to the public Internet via ngrok‘s free plan and have restarted ngrok since you created the Nexmo application, the webhook URLs will have changed. 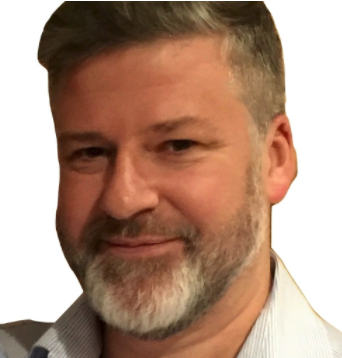 Edit the Message API application webhook URLs before continuing. 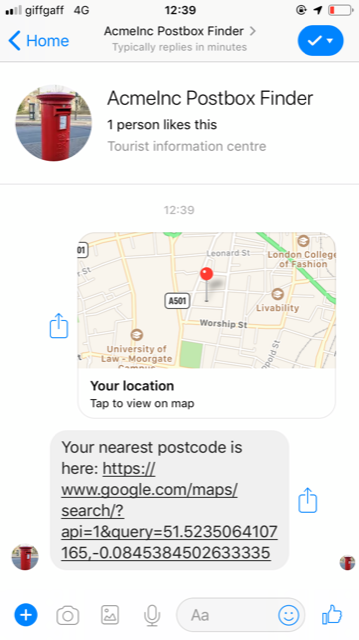 From a mobile device with the Facebook Messenger app installed, send your device location to your Facebook business page. 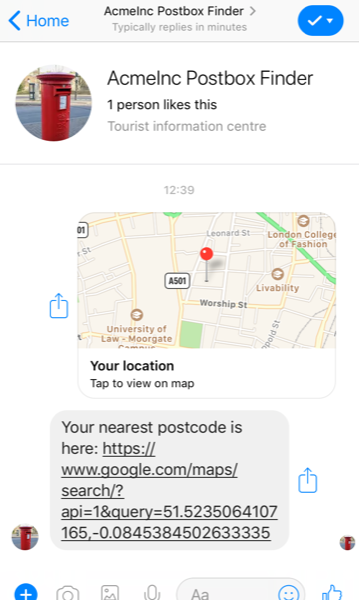 From within the Facebook Messenger app, tap the Location icon or tap the More icon and then select Location. If everything is working properly you should receive a message with a link. Clicking on the link shows a map with a marker that represents your closest postbox. All the application logic is in index.js. Nothing happens until an incoming Facebook message causes Nexmo’s APIs to make a POST request to the /webhooks/inbound-message webhook. The request body contains a message property which is the bit we are interested in. "text": "99 Ditton Court Road, Westcliff-on-sea, Essex SSO 7HG"
The webhook handler logic routes the request appropriately. 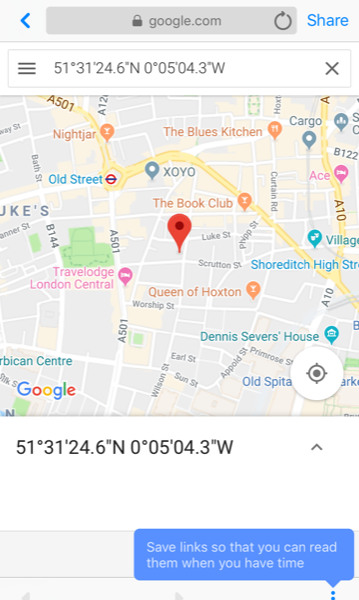 If we already have the user’s geographic coordinates we can use them to look up their nearest postcode. If we only have their address then we need to geocode that address to find out the map coordinates for that location. The more address information the user provides, the better the result is likely to be. 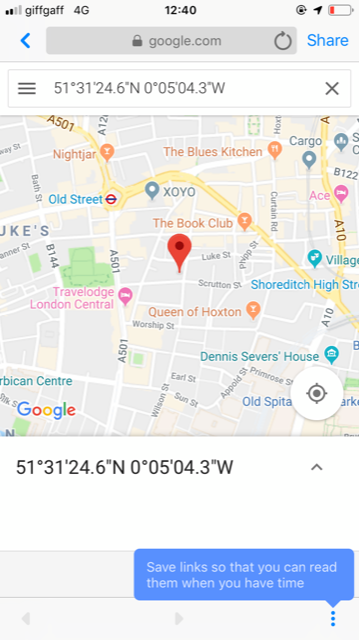 In either case we need to do a bit of processing to extract the coordinates of the user’s nearest postbox because the postcode locator service returns CSV. That’s a bit of a shame: JSON would be easier to handle. Then, finally we can generate a map with a marker that shows that location. This workflow is implemented as a chain of promises with some very basic error handling. The postbox locator service expects a latitude/longitude map coordinate. If the user only provided an address, we don’t have one. So we need to turn that address into a map coordinate. This process is called geocoding. There are a bunch of APIs you can use for this, but we’re going to use LocationIQ which has a pretty generous free tier that allows up to 10,000 requests per day. That should be ample for our purposes! countrycodes: The postbox locator service only contains details about UK postboxes, so we can save the geocoding service some time by limiting lookups to gb addresses. limit: We’re only interested in the closest match, so we’ll set limit=1 to ignore any others and shortcut the search process. If the user supplied a valid address, we will have a map coordinate we can pass to the postbox service. 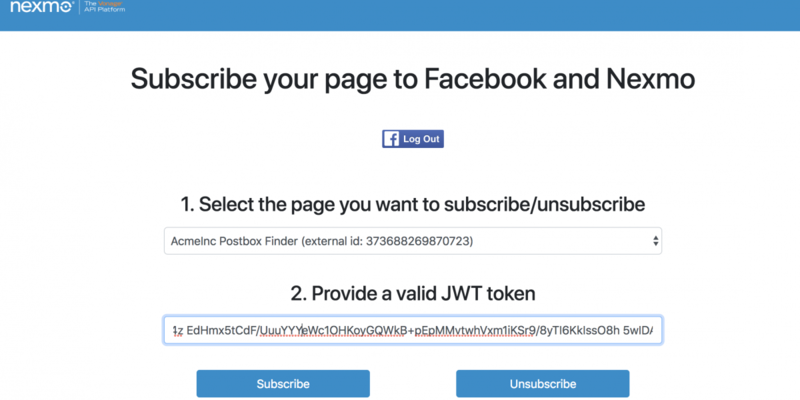 Finally, we want send our user a Facebook message containing the results. If you want to extend the application there are a couple of things I’d like to suggest. Firstly, we’re not using all the details returned in the response to the postbox locator service. There’s info there about distances, collection times and, of course, alternative postboxes in the vicinity. Your app could make use of those. And of course this workflow lends itself well to other “find my nearest thing” scenarios using any dataset with real-world locations. If you don’t have map coordinates then you’ll probably want to batch-geocode them (LocationIQ can help with that). Then, in order to find out which items are nearest to a given point you might want to look into a spatial indexing package such as geokdbush. However you proceed, have a very happy Christmas from all of us in the Developer Relations team at Nexmo.